Grand Mayan Nuevo Vallarta - Rent Unused Weeks Direct From Owners! The huge waterpark areas for adults and kids including a lazy river that wraps around the pool area make the Grand Mayan in Nuevo Vallarta our most popular resort by far. Our connections with well over 100 owners allow you to rent their unused weeks for surprisingly affordable rates. This resort location is the first to have a complete water park exclusive to the Grand Mayan Nuevo Vallarta. This pool complex has features for adults and children alike. The lazy river and water slide appeal to children of all ages. This new complex also has the the latest in luxury accommodations. The suites are for those who are looking for more space and more amenities. Jacuzzi tubs in each bedroom , large balconies with a cooling pool in the one and two bedroom suites. Many of our guests go to this resort specifically for the seemingly endless waterpark. The Grand Mayan is the central facility on this huge resort grounds. There are also the new Grand Bliss and Grand Luxxe buildings. The Mayan Palace resorts have already been called the most spectacular in Latin America. Grand Mayan takes it up 3 notches with more than 1200 square feet for a two bedroom unit! We have provided amenity information on the bottom of this page. Scroll Down for pre-reserved weeks with confirmation numbers just waiting for us to put your name on them. To book one of these weeks, just email us the exact date and location or call 616-855-4468. We will send you information on making the payment when you book it. If you don't see what you need, just click the button and fill out the form, we'll check for it and get right back to you. 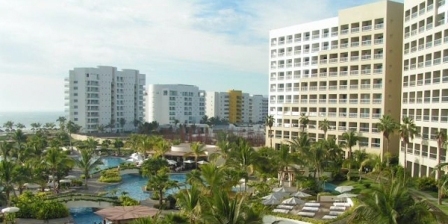 Jul 5, 2019 Nuevo Vallarta Grand Mayan One Bedroom 1990.00 8 rounds of golf and 2 massages. ** A split is a one bedroom and a studio (these are the two halves of a two bedroom suite). However these units will not be connected, so they won't work if you have young children. © MayanRental. All names, images and information regarding Grand Mayan®, Grand Bliss®, Grand Luxxe® and Vida Vacations described in MayanRental are protected by copyright and are registered trademarks of a third party which is not affiliated or related in any way with MayanRental.